currentMood: How did Fashion Revolution come about? Carry Somers: On 24 April 2013, 1138 people were killed and 2500 injured when the Rana Plaza factory complex collapsed in Dhaka, Bangladesh. 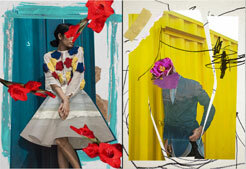 In the following days, everywhere I looked, there were newspaper articles calling for a more ethical fashion industry. Meanwhile, campaigners had to search through the rubble for clothing labels to prove which brands were actually producing there. The lack of transparency in fashion supply chains meant it took many brands several weeks to work out what their relationship was with that factory complex. I knew we needed to find a way to channel public concern into a longstanding campaign so that the victims of Rana Plaza, and all the other tragedies that have occurred in the name of fashion, will never be forgotten. That’s when Fashion Revolution was born. Four years on we now have teams in almost 100 countries around the world. +Greek fashion designer Athena Korda ends her collection with the slogan ‘who made my clothes’, April 2015.
cM: Tell us a little bit about setting up Fashion Revolution. Was it easy to find like minded people, biggest hurdles you’ve faced? CS: Fashion Revolution believes that rebuilding the broken links across the whole supply chain is the only way to change the entire industry. We need to raise awareness of the fact that we aren’t just purchasing a garment or accessory, but a whole chain of value and relationships from the people who sewed and embellished our clothes, all the way down to the farmer who grew the cotton. In order to achieve this, we are working with policy makers, NGOs, brands, designers, retailers, educators, producer groups and, of course, consumers. the Garment Worker Diaries a year long research project led by Microfinance Opportunities in collaboration with Fashion Revolution and supported by C&A Foundation. MFO’s on the ground research partners meet with nearly 600 garment workers on a weekly basis for an entire year. Our hope is that clothing companies, consumers, factory owners, and policy makers will be able to use the project insights to understand how the decisions they make affect garment workers’ conditions. Fashion Revolution is working to get the data in front of change makers who can influence the global clothing supply chain, the regulatory environment, and the social protections available to garment workers. One of the most important agents of change is the consumer, the driver of trends and clothing orders. cM: What’s your biggest challenge? CS: One of our biggest hurdles has been the perception that clothing produced in a more ethical way is unaffordable. In terms of the price, three quarters of those questioned in a YouGov/Global Poverty Project survey said they would be likely to pay an extra 5% for their clothes if there was a guarantee that workers were being paid fairly and working in safe conditions. It has been estimated that putting as little as 25p onto the cost of a garment made in Bangladesh would provide the producers with a living wage and pay for factories to meeting fire and building safety standards. Fanzine, our magazine shows the cost breakdown of a t-shirt and how much more one would have to pay if the garment workers were paid a living wage. cM: Alliance for Bangladesh Worker Safety was set up post the disaster – how do they ensure sweatshop free production? Which brands have signed up? safety issues in Bangladesh: the Bangladesh Accord on Fire and Building Safety and the Alliance for Bangladesh Worker Safety which requires financial support for factories in order to make the necessary repairs. The Alliance was set up as an alternative for those brands who did not want to sign the legally binding Accord and is comprised mainly of North American brands. The Accord has a high level of transparency and includes worker representation, whilst the Alliance does not make inspection reports publicly available and it has been reported that workers in factories have not been involved in the inspection programmes. 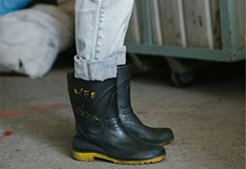 A report published this month as part of our Garment Worker Diaries project found that only 44% of workers felt safe all the time at work and 40% had seen a fire at their factory. The lack of transparency in the Alliance reporting process means we have no way of knowing how safe workers are in these factories. Moreover, indirect sourcing strategies are prevalent in Bangladesh and the supply chain is driven by pursuit of the lowest possible cost. It has been estimated that 3 million garment workers, some of the most vulnerable workers in the supply chain, aren’t covered by these audits. 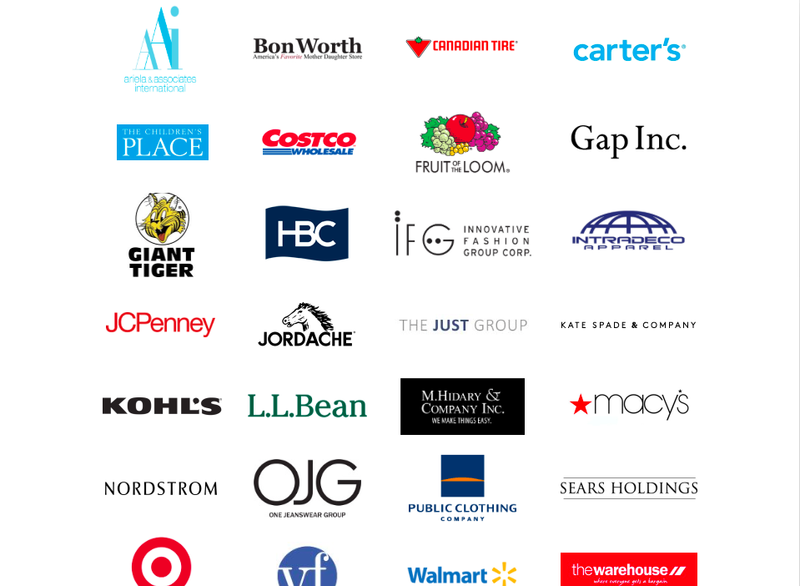 Here is a list of brands that have signed up. cM: Why is it difficult to achieve transparency in the fashion supply chain? really works, from fibre through to final product, use and disposal. We want to see an increasing number of brands make their supply chains more transparent, because you can’t start to tackle social or environmental exploitation unless you can see it. 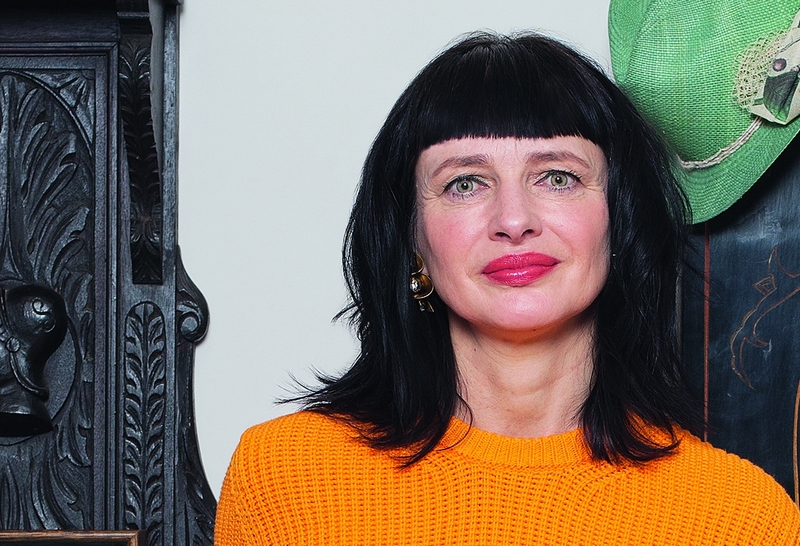 In order to create a sustainable fashion industry for the future, brands, and retailers must start to take responsibility for the people and communities on which their business depends. Tragedies like Rana Plaza are preventable, but they will continue to happen until every stake holder in the fashion supply chain is responsible and accountable for their actions and impacts. cM: Are there any brands that have a transparent and ethical supply chain? CS: Prior to founding Fashion Revolution, I had first hand experience of the importance of transparency in the fashion supply chain as for the previous three years my brand, Pachacuti, had been a pilot for the EU Geo Fair Trade project which aimed to provide visible accountability of sustainable provenance, both for raw materials as well as production processes. We traced the production of our Panama Hats using GPS technology to the exact coordinates of 154 of our weavers’ houses. This isn’t an easy job when only 45% of their homes are accessible by road, located high in the Andes. Pachacuti’s weavers were delighted that this research data helped correct a historical misnomer and Panama hats could now be tracked back to their country of origin – Ecuador! We then mapped the GPS coordinates of each plot of land in the coastal cloud forest where the straw is harvested on community-owned plantations. Other brands known for their transparent and ethical supply chains include Everlane, Zady and Honest By. In terms of mainstream brands, at the moment none of us have enough information about where and how our clothes are made. We have the right to know that our money is not supporting exploitation, human rights abuses and environmental destruction. There is no way to hold companies and governments to account if we can’t see what is truly happening behind the scenes. This is why transparency is so essential. In this year’s Fashion Transparency Index, published by Fashion Revolution in April, we found 32 out of 100 brands were publishing supplier lists at the first tier — where our clothes are typically cut, sewn and trimmed. This is an increase from 12.5% last year. 14 brands are publishing some of their processing facilities — where garments are laundered, printed, dyed, finished or otherwise processed in an earlier stage of production. Bershka, Massimo Dutti, Pull & Bear and Zara (all owned by Inditex) are publishing a list of their wet processing facilities but not their tier 1 manufacturers. No brand is publishing a list of their raw material suppliers, so there is no way for the public to know where their cotton, wool, leather or other fibres come from or who produces them. 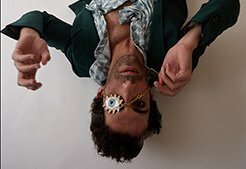 cM: Does a purchase from a luxury designer label ensure that the products are ethically produced? 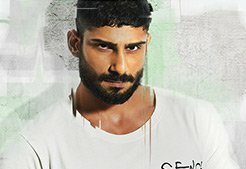 CS: Paying more for an item of clothing doesn’t ensure ethical production as a lot of what the customer pays is for marketing. Some mass produced luxury clothing is produced on the same production lines in Bangladesh as fast fashion brands. They may pay an extra 25 cents for some extra detailing, but most of the difference in retail price comes down to the brand’s mark-up. Out of the premium and luxury brands reviewed in our Fashion Transparency Index 9 scored between 21-30% of the total possible points, which was higher than the average (Bottega Veneta, Gucci, YSL, Hermès, Hugo Boss, Burberry, COACH, Hudson’s Bay Company and Sak’s Fifth Avenue). The other 10 scored 15% or less (Dior, Chanel, Ermenegildo Zegna, Neiman Marcus, Prada, Miu Miu, Giorgio Armani, Michael Kors, Ralph Lauren, Louis Vuitton). 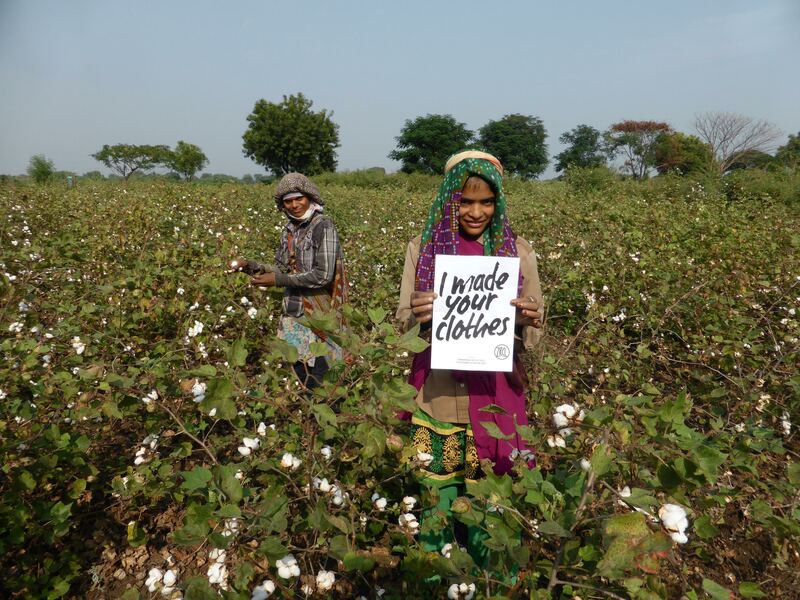 cM: Tell us about #whomademyclothes campaign – do brands always reply? What are the other ways of making brands accountable for their production? CS: Fashion Revolution’s theme for 2017 is Money Fashion Power which will be exploring the flow of money and structures of power across the fashion supply chain. We want people around the world to show their label, post a photograph on social media, tag the brand and ask the question #whomademyclothes. By doing this, we are applying pressure in the form of a perfectly reasonable question that brands and retailers should be able to answer. A lot of brands respond. Brands who answered #whomademyclothes this year include Gstar Raw, Monsoon, Pull and Bear, Fat Face, Rag and Bone, Zara and Massimo Dutti. There were 133,000 posts using our hashtags during April with 533 million impressions on Twitter and Instagram, an increase of 241%. 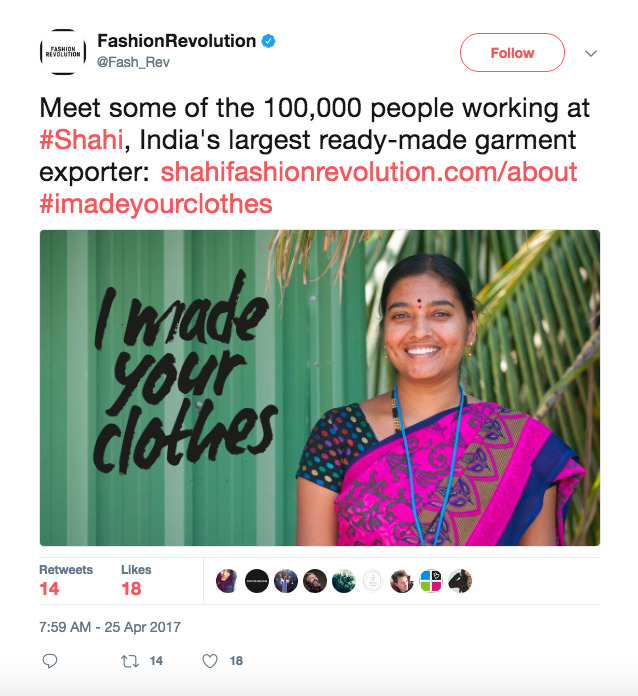 Shahi, India’s largest ready-made garment exporter, set up an entire website for people to meet some of the 100,000 people working for them. 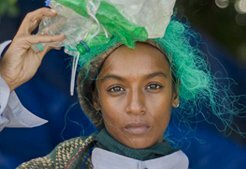 Policies & Commitments – what are the standards and goals the company sets itself for the protection of human rights and the environment across the supply chain? Governance – who in the company is responsible for the company’s human rights and environmental impacts across the supply chain? Traceability – how well does the company know its supply chain and what does it make public? Audits & Remediation – how does the company go about checking its supply chain for compliance with its policies and standards? And what is its approach to dealing with suppliers who fall below these standards? Spotlight issues – what is the company doing to address living wages, unionisation and collective bargaining and business model innovation? By publishing the Fashion Transparency Index, our aim is to provide insight into just how much or how little consumers know about the clothes they buy. By publishing the Fashion Transparency Index, our aim is to provide insight into just how much or how little consumers know about the clothes they buy. We hope the this encourages consumers to want to find out more about the stories behind their clothing, spurring them on to ask #whomademyclothes. Through the Fashion Transparency Index, we want to see fashion brands and retailers increase levels of supply chain transparency and communications, using the 2017 edition as a baseline and hopefully seeing improved scores year on year.